Well, I finished my Handwoven “Not Just For Socks” entry. I’ve named it the Just For Socks Bag and I thought you might all be interested in seeing the final product. Especially since all I passed around at Show and Share were the pieces. I was going to bring it to the March meeting but it’s on it’s way to Colorado! Yup, it’s a finalist. I’ve been pinching myself a lot lately due to an extraordinarily good start to 2010. Thanks Betsy for suggesting I go for it. Now I need to make another sock project bag because I really need one ! I would like to place an order and get my name first on the list. I love this! It is such a mixture of all the goodness there is when it comes to fibers – the weaver, the seamstress, the knitter, the originator, the wool, the colors, the patterning ….. and I really like the addition of the leather. Congratulations and best of luck to a finalist!! I do like thinking “outside of the box” but form needs to follow function for me. I get a chuckle thinking about cutting up my leather Salvation Army find to make this bag. I even used some of the leather to repair a rip in Ron’s jacket. My fibery world came full circle when I learned to weave! Kathie! That is nothing short of fantastic! Well done in every detail. And, speaking of, what is the adornment at the top? Congratulations on being a finalist! SO exciting. On the top, there’s a leather wrist strap that fits snug with the help of magnetic snaps. The back side of the snaps are where the buttons are. 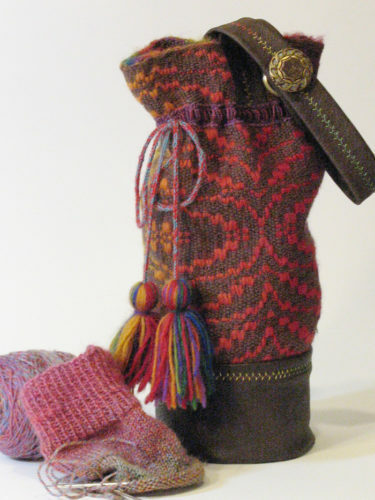 That way, I can knit socks as the yarn feeds through the top of the bag and everything stays in place. Plus I can walk and knit, if that’s possible. I’ve never tried it. I’m very excited about the contest from this point on. I had a funny feeling that I might make the cut when my art studio was buzzing with ladybugs today. Aren’t they good luck?! Fabulous, Kathie! It’s really pretty, and will be very useful when you get it back. Congratulations on making the first cut! Kathie – you’ve outdone yourself! Your imagination and creativity are truly inspiring! Congratulations on being a friendly funny fearless fab fiber finalist!! Best of luck!! Good for you – but, then, am not surprised, as everything that I’ve seen you do has been unique, well-put-together, etc., etc. Am very happy for you!!!! Kathie, Congratulations on a wonderful piece and for becoming a finalist. This bag is just beautiful and has so much to teach. I can’t wait to actually see it live. As usual, I love the details, especially the button. Here’s an interesting tidbit I learned yesterday. Did you know there’s a National Button Society? Well, they are having a show in Manchester, NH in April. I’m going to drive up there. Is anyone else up for it? Kathie the bag came out great! Congratulations on being a finalist, no surprise there. Love everything you do! What a warm and supportive group we have! Eileen- I’m up for a field trip. I went to a button show once and it was a lot of fun. But of course you are a finalist! This little number is just spectacular! So happy for you.